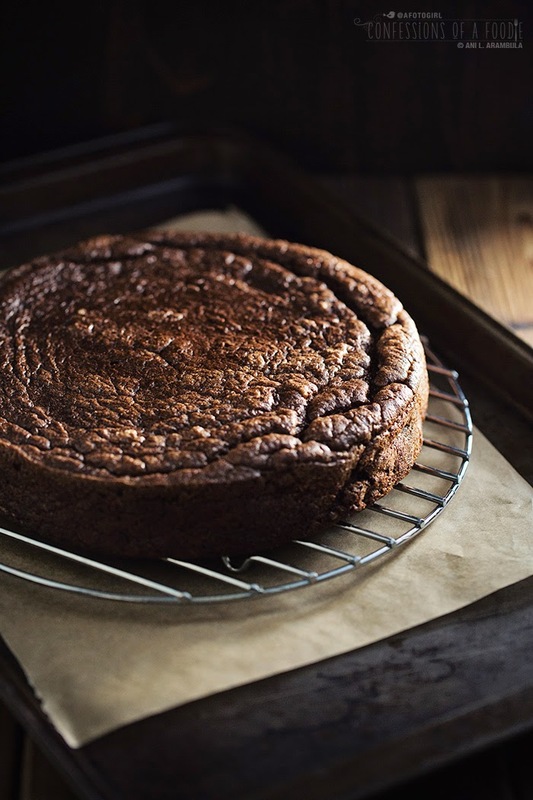 Sweetened with stevia, this recipe for flourless chocolate orange almond quinoa cake is gluten free, diabetic-friendly and low glycemic. This gluten free, sugar free torte is wonderfully orange-scented. Whipped egg whites give this almond torte structure while the addition of cooked quinoa ensures both moisture and a more cake-like texture. For best results, refrigerate a few hours before serving. As difficult as it is for me to process, a surprising number of people have crossed my path who have mentioned that their birthdays were rarely, if ever, celebrated as children. Often, the non-specialness of the day had nothing to do with religion or lack of money but rather, in most cases, it had everything to do with parents lacking time or simply choosing to treat the day like any other. That was never the case in my family. We were not, and most likely will never be, a family of financial wealth. Indeed, my parents worked very hard to keep a roof over our heads, our bellies full, our feet shoed. We lived, as most large families do – very modestly, sometimes even paycheck to paycheck. We were fortunate enough to have grandparents and aunties who helped out, neighbors who shared, parents who filled our lives with love and opportunity even when it meant they went without. So yes, we might have been what some would have called “cash poor," but we were always rich with love and a deep desire by my parents to provide us with more experiences than they had as children. Even in the roughest of times, my parents worked tirelessly to make us feel special and safe from the troubles of the world. There were themed birthday parties with dad making our favorite dishes and mom baking and sewing new outfits. One birthday, it was during the summertime so it was either for my sister Cat or my sister Barb whose birthdays fall in June and July, respectively, that mom made all of us Hawaiian outfits for a luau theme. There are pictures around somewhere to prove it of happy, smiling siblings. There were Disney and Holly Hobby themes with cakes in the shape of Mickey Mouse or Cinderella and hand-sewn Holly Hobby or Raggedy Ann and Andy dolls that were lovingly handmade (I still have mine, all in mint condition). The day was always filled with friends and family and actual games like pin-the-tail-on-the-donkey, musical chairs, and of course, the star of every birthday party, the dime store candy-filled piñatas. As we grew older, the big family parties turned into slumber parties with girlfriends and the days made even more special if they fell on a school day by mom keeping us home from school to spend the day with her for one-on-one time. In a family with five children, that was indeed a treat. Now as adults, we don’t always gather for large birthday celebrations as we once did as children, opting instead to spend welcomed quiet time in contemplation because our lives have become so incredibly busy. We still do go out of our way to show our love and gratitude and when it’s a milestone birthday, of course, the family gathers. Today is my birthday. I sit here pouring over a wealth of memories of the previous 48 birthdays filled with home-baked cakes and handmade gifts and parties filled with music and laughter and I am filled with contentment, joy and gratitude for having parents who have always worked so hard to make me feel like my birth and addition to their lives has been nothing less than a blessing. So today, on my birthday, I also want to express my gratitude for this space and all of you. May the coming year bring good health, laughter, love and blessings both big and small. To up the orange flavor, this torte uses orange infused extra virgin olive oil. I love Asara brand which is a product of Sicily, Italy. Find it locally in San Diego at North Park Produce or online here. If you can’t find orange olive oil, use regular olive oil, minus 3 tablespoons and add 3 tablespoons of orange juice or subtract 2 teaspoons of olive oil and add 2 teaspoons of orange extract. To make the ganache, I used Lily’s Dark Chocolate candy bar which is 55% cacao, Non GMO and naturally sweetened with stevia. Locally, you can find it at Whole Foods, Sprouts, Krisp. Alternately, use Ghiradelli 60% Cacao Bittersweet Chocolate Chips (these use real sugar but less than say, milk chocolate). This looks complicated with a lot of steps but it really isn't difficult. I just broke the recipe down and wrote it in chunks the way I approach a recipe when making a dish; makes it more manageable in my opinion. Active time is only about 20 -25 minutes. Prepare the pan: Pre-heat oven to 350 degrees Fahrenheit. 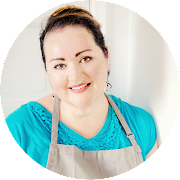 Trace the bottom of a 9-inch cake pan onto baking parchment, cut out and, after spraying the bottom of the pan with baking-style cooking spray (such as Pam Cooking Spray for Baking ), line the pan with the parchment paper. Spray the parchment and the sides of the pan with the baking spray; set aside. Make the quinoa: Rinse the quinoa well; place in a saucepan with water; do not add salt. Bring water to a boil, cover, reduce heat to simmer and cook for 15 minutes or until water is absorbed. Tip the quinoa out onto a rimmed baking sheet, spread out and allow to cool. 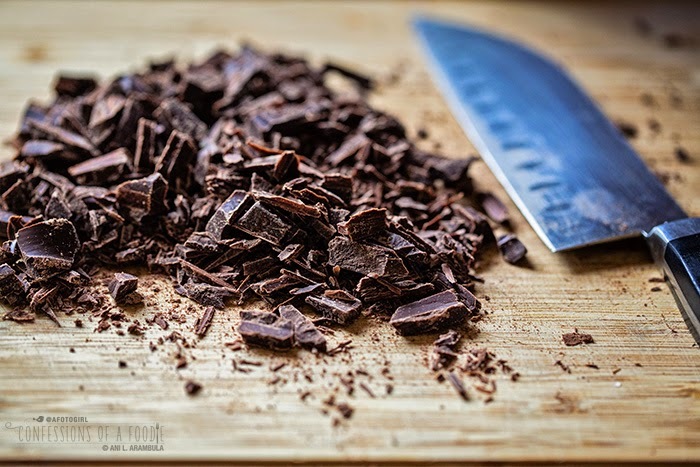 Bloom the cocoa: Add water to at least a 2-cup capacity glass measuring cup or microwave-safe bowl and microwave for 3 minutes on high. Stir in the cocoas and espresso powder, whisking with a fork or small whisk until smooth; set aside. Process the dry ingredients: Add the almond meal, cooked quinoa, salt, baking powder and zest to the bowl of a food processor with the s-blade and process for 3 minutes. Transfer the quinoa mixture to the bowl of a stand mixer; set aside. Separate the eggs, placing the egg whites into a large mixing bowl; set aside whites. Add the yolks, orange juice, olive oil and stevia to the cocoa mixture, whisking well until smooth. Pour the cocoa mixture into the dry ingredients and with the whisk attachment, mix on high for 2 minutes; set aside. Whip the egg whites: Using electric beaters, whip the egg whites until stiff peaks hold. Gently fold in ⅓ of the whipped whites to the cocoa mixture with a rubber spatula until incorporated and no white blobs remain. Fold in the next ⅓ of the whipped whites gently until incorporated. Finally, gently fold in the last ⅓ of the whipped whites. Pour the batter into the prepared pan. 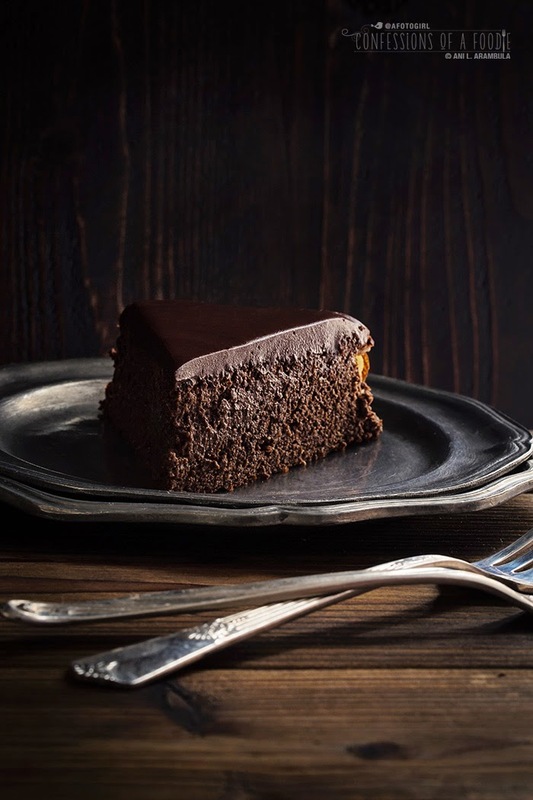 Bake for 30 - 35 minutes or until the center just barely jiggles and an inserted toothpick comes out clean for a "fudgier" torte or until the center no longer jiggles at all for a more cake-like texture. 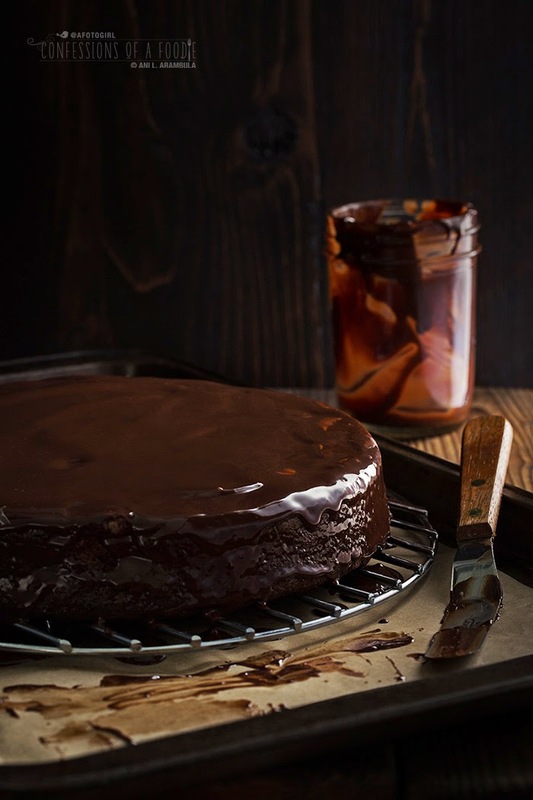 Place pan on a wire cooling rack and immediately run a knife or off-set spatula around the edges to release the torte from the sides of the pan. 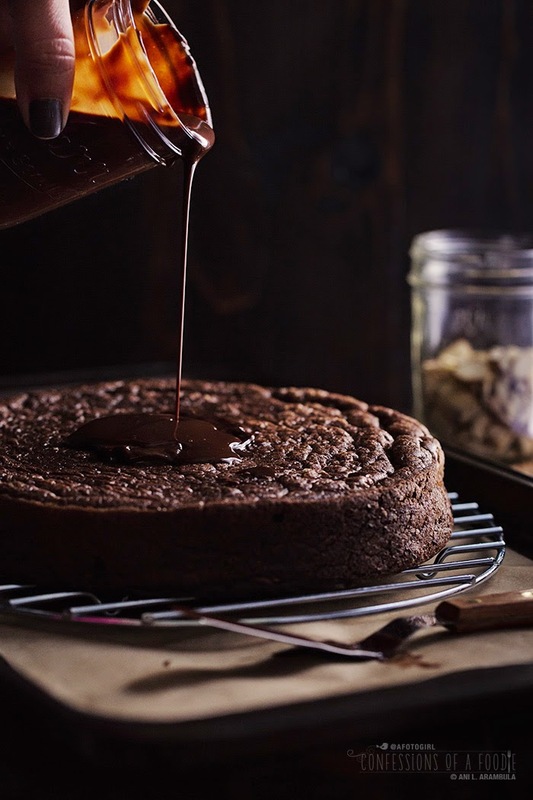 Allow torte to cool in pan for 20 minutes. Invert onto a large dish, removing the parchment paper from the bottom of the torte. Place the cooling rack on top of the torte, and invert again so that the torte is right-side up. Allow to cool completely. 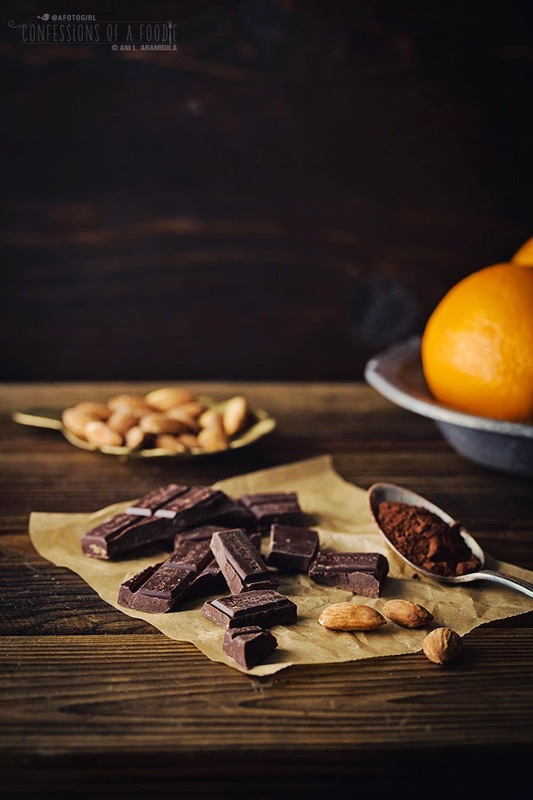 Make the ganache: Once the torte is completely cooled and ready to be finished, place the chopped chocolate into a small bowl; set aside. 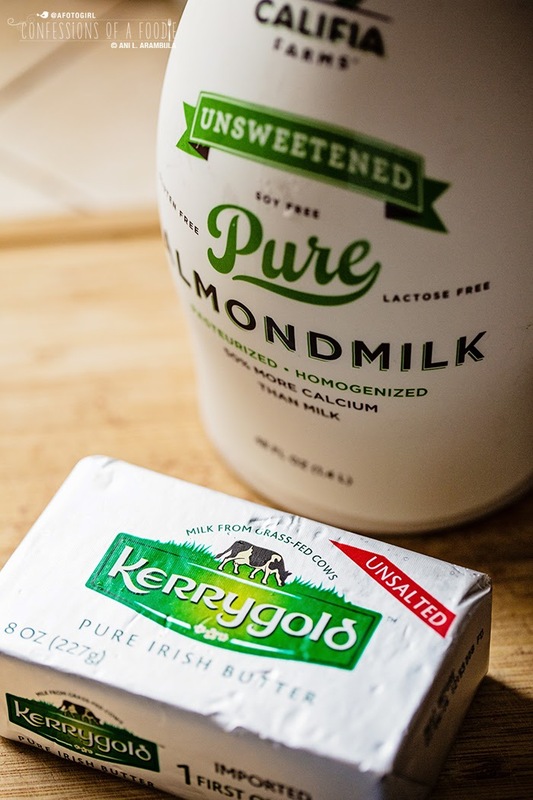 Pour the milk and juice into a small saucepan and place on medium heat. Add the butter, swirling the pan continuously until the butter melts. Pour the milk mixture over the chocolate and stir well until the chocolate is melted, smooth and glossy. Finish the torte: Line a large rimmed baking sheet with parchment or waxed paper. Place the cooling rack with the torte into the baking sheet. Pour the ganache over the torte. 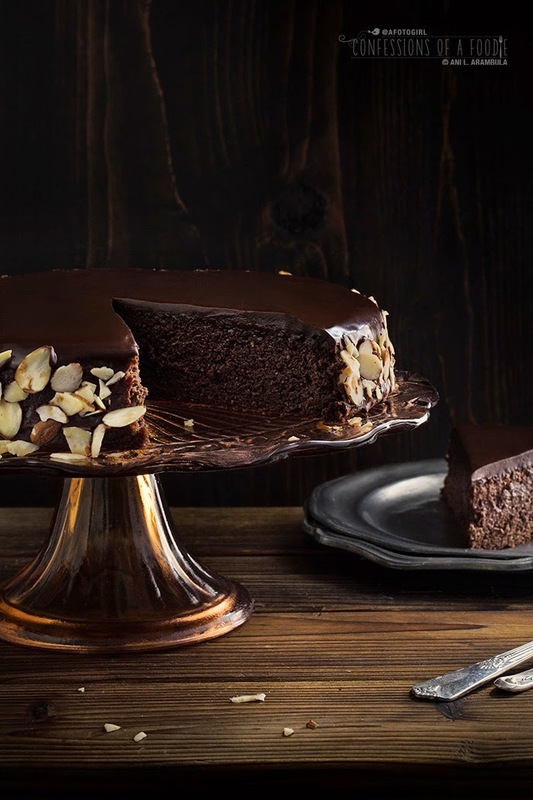 Use a small off-set spatula to smooth the ganache and make sure the sides of the torte are also evenly covered with ganache. Allow ganache to set for 10 minutes. Using two bench scrapers or two large spatulas, carefully transfer the torte to a cake stand or serving plate. 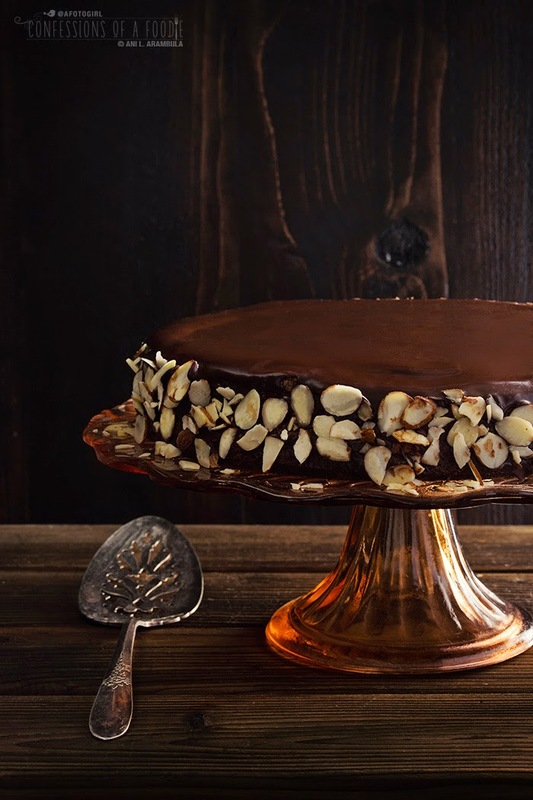 Working with a little at a time, press the sliced almonds into the ganache around the sides of the torte to decorate. Refrigerate torte for at least 2 hours before serving. Store leftover torte in refrigerator. and enjoy within 2-3 days. Note: This post contains Amazon affiliate links. If used to make your purchase, I will receive a small stipend to help defray costs of running this site. Non-Amazon links are for your information only. I only link to products and companies that I know and use myself. HAPPY BIRTHDAY! Ani. I always enjoy your posting. Keep them coming.